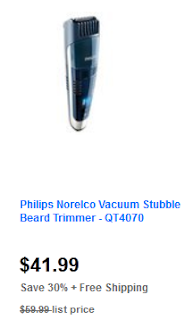 Philips Norelco Vacuum Stubble Beard Trimmer - QT4070 30% off ($41.99 now). Check out this and other items on today's Father's Day specials at Target. Go through Shop at Home and earn up to7% cash back on your Target purchase.